As a result of participating in this learning activity, the learner will be able to demonstrate knowledge of the care necessary for individuals receiving enteral nutrition by passing the final exam with a score of ≥ 70% at the end of the on-line learning activity. 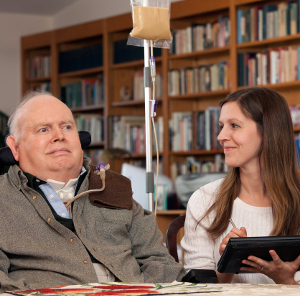 In the past, aides in home care and long-term care have had limited exposure to individuals receiving enteral nutrition, commonly referred to as tube feedings. However, this is changing rapidly with the increase in the level of care needed for individuals in home care and/or skilled nursing facilities. Aides in these settings need knowledge of current enteral nutrition care guidelines to meet these changing needs. This module provides aides with knowledge of current evidence based care for individuals receiving enteral nutrition. Aides will have the opportunity to learn about the gastrointestinal system and how it relates to different feeding tubes, nutritional formulas and supplies. In addition, current evidence based care techniques and observation skills necessary for providing effective care for individuals receiving enteral nutrition will be discussed. This is a self-paced course with knowledge check activities. These non-graded activities allow you to check your understanding of the lesson objectives before proceeding on in the course. At the end of the course, you will be required to take the final exam. You must score 70% or higher to pass the course and complete the evaluation in order to obtain a certificate of completion. This course is designed to meet the continuing education requirements of health care professionals such as Home Health Aides or Nursing Assistants working in home care or skilled nursing facilities. Nancy Hust is a certified Nurse Educator with over 35 years of experience in nursing, encompassing home health care, long term care and acute care. For the past 12 years, Nancy has been primary instructor for the practical nursing program at Rochester Community and Technical College in Rochester, MN, focusing on nursing fundamentals and geriatric care. During that time, Nancy served as Faculty Champion for the Upper Midwest Geriatric Nursing Education Alliance. She was also a fellow in the Faculty Learning about Geriatrics program at the University of MN Hartford Center of Geriatric Excellence and a contributing scenario author for Elsevier Simulation Learning Systems for LVN/LPN's. This course was developed by Rochester Community and Technical College's Continuing Education and Workforce Development Division located in Rochester Minnesota.